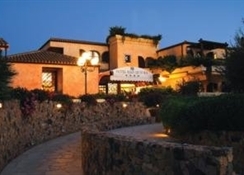 The delightful Baia di Nora Hotel overlooks the sparking sea and the splendid Santa Margherita di Pula beach on the island paradise of Sardinia. This charming 4 Star holiday hotel offers an unbeatable seafront position and 121 comfortable standard rooms and family rooms, most of which boast enchanting views of the sapphire sea or the lush parkland landscape. 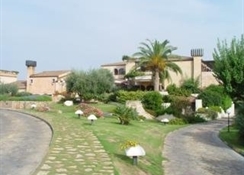 If you are looking for an unforgettable vacation with a peaceful atmosphere and excellent service, the Baia di Nora Hotel is a perfect holiday value choice! 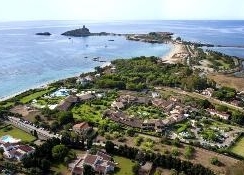 Cagliari Airport is 35 km from the hotel. 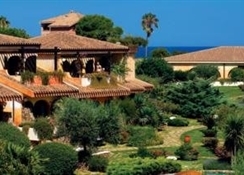 Local Tips: The hotel is in a perfect position to rent sailboats, enjoy wine tasting, play a game of golf at the nearby clubs, go horseback riding, visit Cagliari and Pula, or discover the archaeological sites of the ancient Phoenician town of Nora. Food, drink and entertainment: Half Board with an option for Full Board. A large restaurant with patio offers lavish buffet breakfasts and lunches and delicious dinner menus with waiter service. The hotel has a snack service for quick lunches, a Barbecue, an American Bar with its fantastic cocktails, and a Piano Bar for evening entertainment. Sports, games and activities: Outdoor swimming pool, sun terrace equipped with towel service, deck-chairs and loungers, Jacuzzi, TV lounge, garden and private beach with free access to chaise lounge, beach towels and parasols, free access to Fitness room, Bowls, table tennis, private beach with sea sports (separate operators with charge), tennis court (charges), 18-hole Golf course within 6 km of the hotel. The SPA facilities offer a great selection of anti-stress, Ayurvedic, and Shiatsu oil massages and much more! Additional: 24-hour reception, multilingual staff, information service, room service, free private car parking, Church nearby, transfers to and from Cagliari Airport (with charge), beach service, babysitting service on request with charge, Internet access in all rooms and common areas, catering for small groups and larger meetings, variously sized rooms and halls with state of the art facilities and equipment and room for 30 to 200 participants. 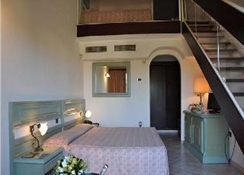 The Baia di Nora Hotel features 121 spacious and comfortable standard rooms and family rooms located in small detached houses tucked away amid natural vegetation and fragrant flowers. All rooms are equipped with air conditioning with independent control, telephone, mini fridge, flat screen Satellite TV, Internet access, safe, private bathroom (hair dryer, electric towel heater, bathroom with Jacuzzi or shower, set of towels and shower gel), and a balcony or patio. Accommodation for disabled guests is available.